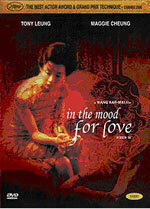 For his first film since the 1997 Hong Kong handover, auteur filmmaker Wong Kar-wai directs this moody period drama about unrequited love that, like his earlier work, swoons with romantic melancholy. Set in a Shanghaiese enclave in Hong Kong in 1962, the film centers on two young couples who rent adjacent rooms in a cramped and crowded tenement. Li-zhen (Maggie Cheung) works as a secretary in an export company while her husband's job at a Japanese multinational keeps him away on extended business trips. Across the hall, Chow (Tony Leung Chiu-wai) works as a newspaper editor and is married to a woman who is also frequently out of town. Neither respective spouse is ever shown in full, instead they are shot from the back or obscured by walls and furniture. Li-zhen and Chow soon strike up a cordial -- if tenative -- friendship. Chow begins to suspect that his wife's long absences are not entirely business related when he stops in unannounced at her office to discover that she is not there. Later, a colleague tells him that he saw his wife with another man. The icing on the cake comes when Chow notices that Li-zhen's handbag is identical to his wife's while Li-zhen discovers that Chow is wearing a tie that she gave her husband; it doesn't take long for them to realize that their spouses are sleeping together. Drawn together by shame and anger, Chow and Li-zhen reveal nothing of their discoveries to their partners. While working through their guilt by imagining how their adulterous spouses first hooked up and rehearsing interrogations, the pair slowly fall in love in spite of their determination to uphold their end of their marital vows.